Since it’s July 3, 2012, and since I’ve been flipping through Ambrose Bierce, The Unabridged Devil’s Dictionary (Athens, Georgia: University of Georgia Press, 2000), it seemed worthwhile to do at least two things. No, wait: three things. The first thing to do is to upload the following photo for some patriotic visual. 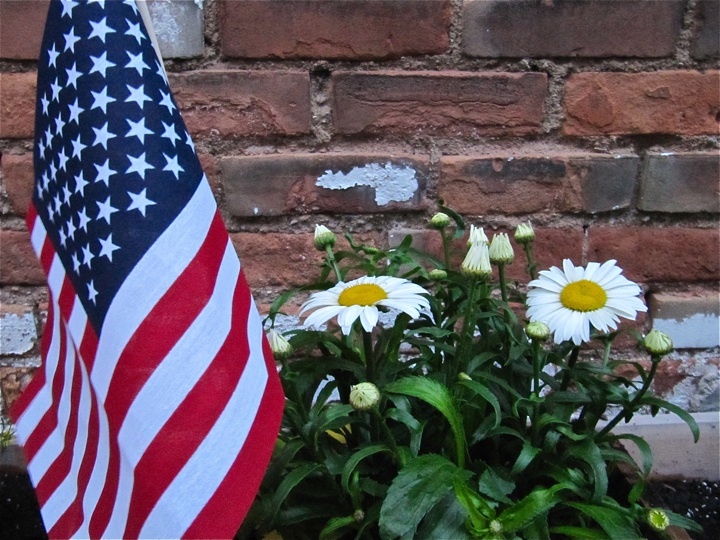 An American flag next to American daisies with a backdrop of an American brick pattern. So above is, as the caption reads, an American flag next to American daisies in front of arguably an American brick design. It is not uncommon for nations to assert and lay claim to certain architectural styles, soccer teams, beers, automobiles, and so on. Anyhow, the second thing to do on this July 3, 2012 is to provide Bierce’s definition of patriotism: “Combustible rubbish ready to the torch of any one ambitious to illuminate his name.” (Bierce, 2000:179) If you made it in and out of the realities of the American Civil War, you too may have grabbed hold of the Skeptical Outlook (One of Bierce’s fantastic short stories on the Civil War is about a hanging). So we can rage patriotic, or rage skeptical, and this brings us to the third thing to do today. In the paraphrased words of Voltaire — something I heard one of those crack Navy SEAL troopers say on the television some years ago — to be a human and American means that we stand up for the right for others to tell us how wrong we are, to disagree with you and me, to carry on this grand human project and to speak our minds. Yes, even if we’re speaking mindlessness. All the better if we’re speaking sense. Wait! I will leave you with a fourth (of JULY!) thing, some fanfare for commoners. Take that, Great Britain and you Tory loyalists — or I guess this was written prior to the Second World War, so take that Nazis! This entry was posted on Tuesday, July 3rd, 2012 at 7:24 pm	and posted in Uncategorized. You can follow any responses to this entry through the RSS 2.0 feed.